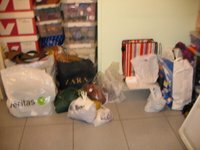 Ok, here they are, as promissed. 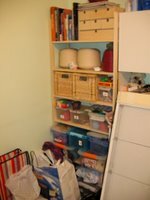 I decided to make me a little photo corner, but of course I forgot to put my digital camera on the right stand (it was still on night-pictures) so the pictures aren't as great as I had hoped they would, but better then nothing, right? When looking at it like this it does look ok! It's still quite small, but well, I'm not using big needles either (3mm I think). I like it this way, we'll see how it turns out! 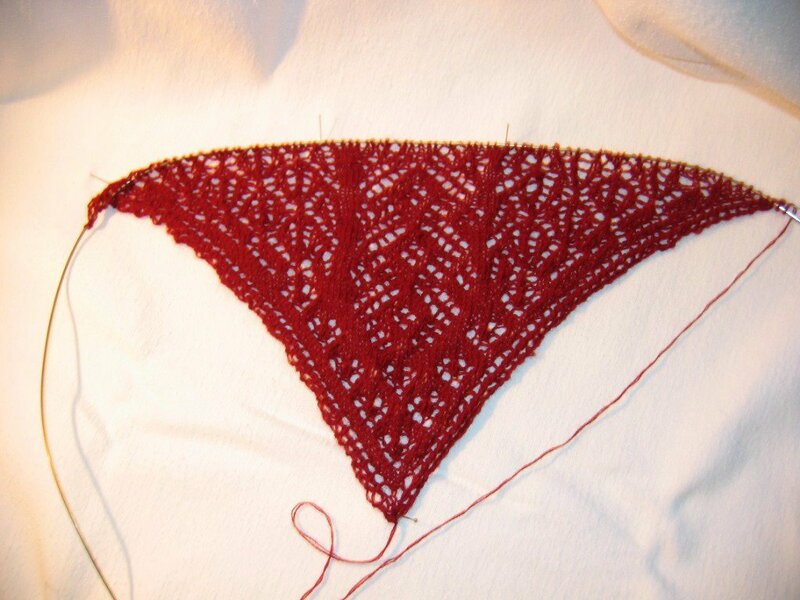 (if you want to see the finished shawl, go here). On the group there's a discussion going on about paying for the mystery pattern. I've been randomly reading messages and I agree and disagree with some. Please skip this if you are not willing to read some of my ponderings! * I wouldn't mind paying for a pattern (it would be only about $3) if I could get a corrected finished version in PDF at the end. * I can imagine this really is quite a lot of work for the designer, so it doesn't matter to me. 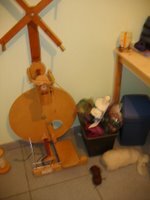 * Someone metionned getting a very tine shawl and using only half of the yarn the designer said it would need. 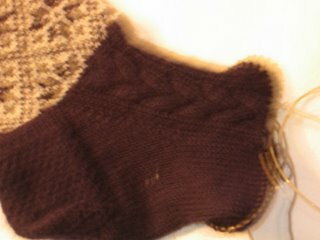 Well, being new to lace I do know that you can knit lace with any size of needles and that will determ the size. I mean, I didn't want to use big needles and I wanted a very tight knitted shawl so this is what I'm getting and it might be smaller then I thought but that's ok! I might knit more lace with heavier weight yarn in the future. Now as for the person complaining, I thought she was pretty rude and if you don't like the mystery aspect then you should knit other lace. * Has anyone of you any complaints/thoughts about Paypal? It's a gift for me 'cause otherwise it would be way more expensive and difficult to order stuff. But I read complaints about Paypal tracking money and all. Hmm, sometimes I feel so distant from things happening! 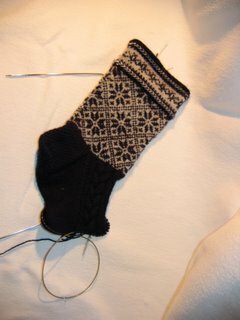 As you can see, I combined Fair Isle and a cable in this sock! :D The foot looks a bit wonky, but I'm doing the upper part in ribbing so it'll fit better, and there's one cable going on the side. I know, these socks look strange. I'm hoping Donni will like them! 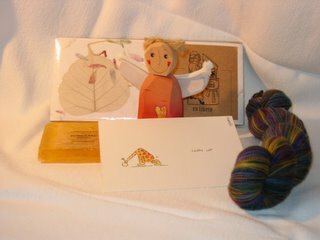 It included a lovely skein of Koigu sock yarn, a letter set, my gardian angel, and some soap! Sweetie, you're spoiling me, thank you sooo much! 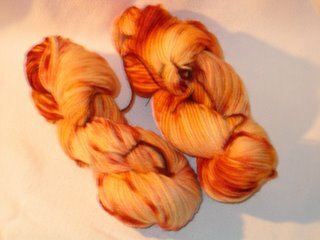 Died with KoolAid, the colours are like a fire burning in our wood stove, I just love it! 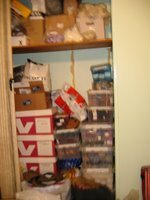 And then, to leave you, some pictures of my yarn room as it is now, in desperate need of some organisation. Oh, and a question : what do you all do to keep out mots, except for lavander and sandal wood? Lke them? I LOVE THEM! YAY! Wow! Those socks are really beautiful! I love the combination of techniques!